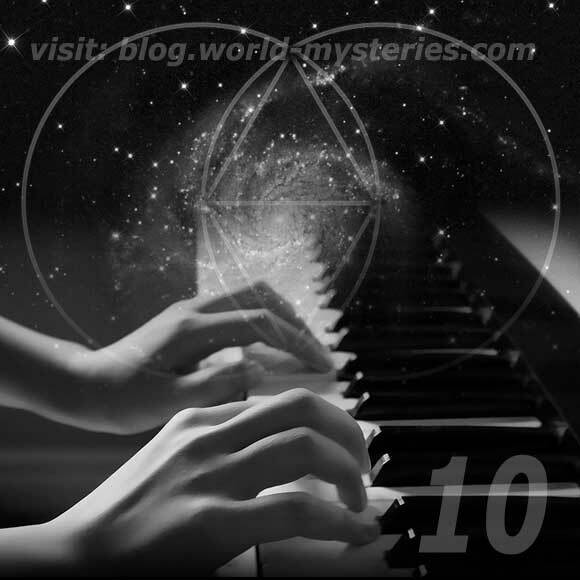 In this article we will be detailing the ten emanations of God. This philosophy is seen expressed in the Jewish book the Sefer Yetzirah and is well known by many in the kabbahlistic Tree of Life. We are not going to be exploring this concept within the Hebrew tongue too extensively and instead we are going to elucidate this concept as it reveals itself to us in the English language. But before we do this, we are going to need to understand the mathematical structure of the English alphabet. This cipher is something I cover in depth in my video series and in the Pi & the English Alphabet book series. 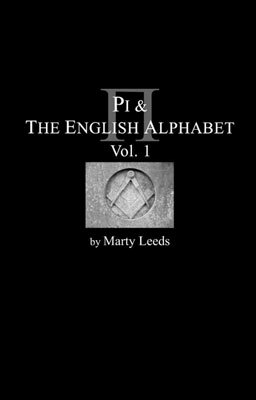 For an article detailing this cipher at length, please check out the article “Decoding the Numerology of the English Alphabet” as well as the other articles I have contributed to world-mysteries.com. Please take the time to intuit this cipher for it has so many hidden treasures just waiting to be unveiled. This cipher was, without a doubt, constructed by highly intelligent, very mystical people who had a direct, gnostic connection to nature and to the conscious intelligence at work within the universe. Below is a very abridged version of this cipher. 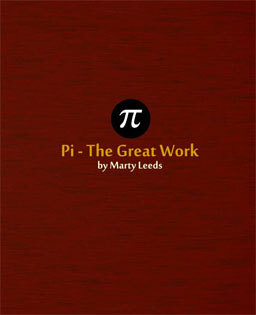 Mathematics is the one language that has permeated all cultures. Countless civilizations, tribes and religions across the world and throughout history have relied on the base ten-system as the mathematical foundation they used in which to understand the world. Looking down at one’s own hands will eradicate any doubts as to why they did. The first verse of Genesis, “In the beginning God created the Heaven and the Earth” consists of 10 words. In the Hebrew translation, we see that this verse consists of 28 letters. These two numbers, 10 and 28, are inexplicably linked to one another and this simple truth is illustrated beautifully on your two hands. 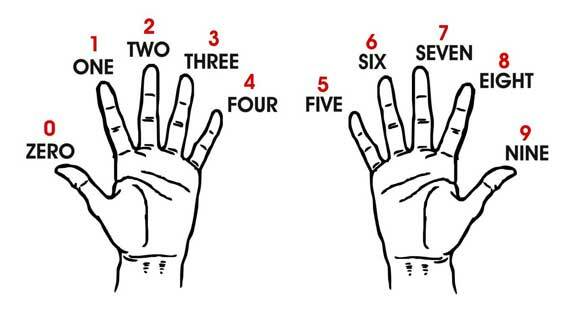 Our 10 fingers are divided into 28 sections known as phalanges and thus both the Hebrew and English text of Genesis 1:1 fit perfectly onto the mathematics of your two hands. We can therefore assume that the story of creation found in the Bible is poetically and allegorically describing the magical construction and Genesis of the YOUniverse. This numeric correlation that we can make between these two languages in the first verse of Genesis is important to note for it is there to help us understand that the same fundamental sacred base of information, expressed in two different languages, is being spoken of no matter what language is used, or what culture interprets it. The Bible exclaims very clearly, within its opening pages that man is indeed made in the image of God. If man is made in his image, the number of fingers we have on our hands, TEN, must therefore be pretty important in helping us understand God. And as we will see, coming to know this base ten-system will help us come to know thyself and therefore, the god who dwells within. The base ten-system, given to us by our creator, will help us intuit the foundational principles upon which the divine manifests its intelligence through us. “Know thyself” is one of the Delphic maxims said to have been inscribed in the forecourt of the Temple of Apollo at Delphi. This maxim is a simple philosophy embodying a deep spiritual truth. To know thyself is to come to know God. The more one becomes the individual that their heart desires to be, the closer that person will come to know the god within. This perfected self was known in Jewish kabalistic literature as the Adam Kadmon. The Egyptian god Atum was one of the most important and oldest gods of ancient Egypt. Atum, also known as TEM, was an essential part of the Egyptian cosmology and is most assuredly where the biblical Adam is derived. Atum, or TEM, was a god of Earth who became associated with the Sun God Ra. Interestingly, TEM is very close to the English word TEN. The word DECA is the Latinized form of the Greek word DEKA and is the base of words, such as decadent, decade (10 years) and the geometric 10 fold decad. DEKA and DECA share the same numerical equivalent of TEN and TEM – words that are all signifying the number ten – with their sum being the “unlucky” number 13. The same number we focused on when constructing the cipher for the English Alphabet. We also see the most astonishing numerical correlation to these four words when we use the English cipher on the terms GOD, LORD, SUN, PAGAN and JEW, for all five of these words sum to 13 as well. The base ten-system, the fundamental numeric system at work in the universe, is the system the Grand Architect utilizes in its great ever-recurring act of universal construction. Not only can any other system be converted to the base ten system (see the number base calculator – http://www.cleavebooks.co.uk/scol/calnumba.htm ) but the qualities of the numbers themselves reveal this absolute fact. With the use of the numerological art known as decimal parity or theosophical addition, we can find the ten numbers at play in the cosmos. Decimal parity, or theosophical addition, is the art of reducing any number down to one through nine. By adding together the sum of the digits in any number, we can find the occulted number within the number being reduced and hence uncover the number’s essence and quality. Example: the diameter of the Sun is 864,000 miles. Adding 8 + 6 + 4 + 0 + 0 + 0 we yield 18, and we can break it down further to find 1 + 8 equaling 9. The diameter of the Moon is 2,160 miles, 2 + 1 + 6 + 0 equals 9 and thus the hidden, occulted number within the measurements of these two heavenly bodies is the number 9. Any number after the horizon of 9 can be reduced down to the digits 1 – 9. 10 becomes 1, 11 becomes 2, 12 becomes 3, etc. 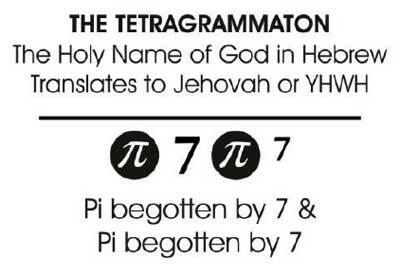 Thus, by focusing on the characteristics of the numbers themselves we can establish our base ten-system NOT AS 1 through 10 but rather as 0 through 9, with Zero being a digit, and the placeholder, thus giving us the ten emanations of our holy heavenly architect and establishing the alphabet of the mathematical language of the divine. As we have come to see in the articles past, this entire numerological phenomenon is expressed exquisitely in the holy name of Jesus. Breaking our numbers 1 – 9 down into a trinity or 1 2 3 / 4 5 6 / 7 8 9 (reflective of the holy trinity – the Father, Son and Holy Spirit), we see we are left with two sets of numbers, and those being 45 and 666, the same numbers we find by breaking up the name of JESUS syllabically. Using our cipher, we can find the most interesting and magical correspondence between our alphabet of the divine and the degrees inside a triangle. The internal angles of a triangle will always sum to 180 degrees. Adding the sum of the gematria values of the words ZERO, ONE, TWO, THREE, FOUR, FIVE, SIX, SEVEN, EIGHT and NINE, we see that our base ten system shares a love of this number 180 as well. By equating the numerical sum of 180 to the internal angles of a triangle, we can see that these ten numbers, the alphabet of God, come together to give rise to the first form in existence – the Holy Trinity. 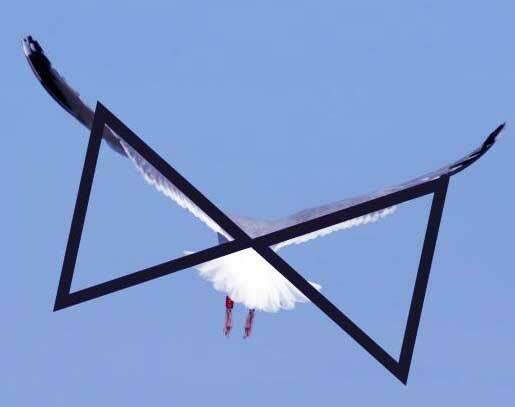 The three points made by the triangle create the first plane in existence. This trinity is the embryonic polygon, the catalyst that commenced the geometric construction of the 3D numerical matrix of our creation. Utilizing the classic Hermetic Maxim of “As Above, So Below” and taking this philosophy into the gematria and geometry, we find that one triangle pointing up, representing the above, and one pointing down, representing the below, now sum to our holy 360 degrees of a circle. By adding up just the digits 0 – 9 we find that they sum to 45 (0 + 1 + 2 + 3 + 4 + 5 + 6 + 7 + 8 + 9 = 45). 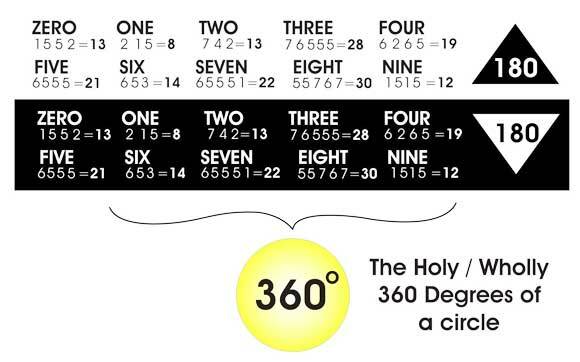 Since we now have two sets of these numbers, we would have 45 twice, or 90, the degrees in a right angle. This 90 is also found in another esoteric numerological constant, the Tetractys. 2, 3 and 4, summing to TEN. Plato assigned numbers to each point on the Tetractys with those numbers being 1, 2, 3, 4, 6, 9, 8, 12, 18 and 27. Adding these TEN digits up, we find that they sum to 90 as well. In sacred geometric teaching, the first form one is to create is known as the Vesica Piscis. 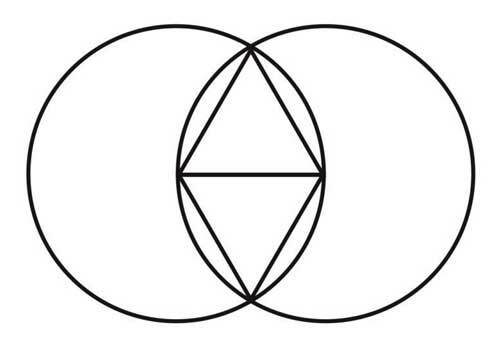 The Vesica Piscis is simply two circles resting on each other’s centers. This womb of creation is the motherly geometric form that allows one a glimpse at the first moments of God’s manifestation. Within the central womb, known as the mandorla, or almond, the student was to draw two triangles, one triangle pointing up and the other pointing down. These two triangles are symbolized in the Freemasonic Square and Compasses as well, the very symbol we used to decode the English Alphabet. These two triangles are also expressed in the measurement of time. An hourglass is two cones, or triangles, that are utilized when keeping track of a particular period of time. The Jewish Seal of Solomon, or Star of David, is two triangles often laid atop, or interlaced with each other. The Lakota natives of North America even shared the symbolism of the two triangles, with their symbol carrying the same philosophy as the Hermeticists, “That which is in the stars is also on the Earth and that which is on the Earth is also in the stars” – clearly another way of expressing the concept of “As above, so below”. These two triangles even find their way into the annals of modern science. The diagram of space and time shown below is a clear representation of basic geometric and philosophical principles understood by many cultures, in many different parts of the world throughout recorded history. These symbols are not Jewish symbols, or Lakota symbols or symbols of science, they are symbols of nature. These symbols do not belong to any one group of people, they are the symbols of humanity, of the universe and of the divine and we have the ability, with our own two hands, to elegantly express these patterns of our father sky (pattern comes from the word pater, meaning father) in art, architecture and in the rebuilding of the new, enlightened and awakened Earth that must come. We have the ability to express the universal intelligence if we so wish. The power of the divine literally rests in our two hands. The crisis we now face on this Earth is a spiritual crisis. 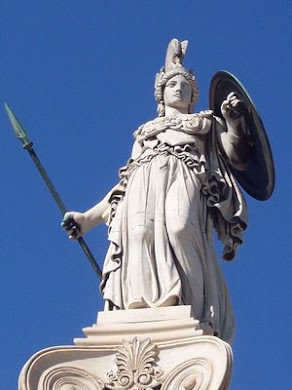 This crisis can easily be rectified if we are willing to let go of the fictional belief systems we make-believe true, come to our childhood’s end and choose to accept and recognize the high wisdom of all the ancient traditions. Spirit in the ancient traditions was akin to Fire and, looking at the attributes of fire, it easy to see why they deemed it so. One single spark can burn entire acres of forests within a few hours. One scintilla of inspiration can illumine a nation. The author and lost civilization researcher Graham Hancock so eloquently exclaimed that the human species is a species with amnesia. We have forgotten our past, forgotten the wisdom of our elders, have forgotten how to live on this Mother Earth. But this is to no avail, for we can wake up and remember what has been dismembered. We need to put our own story back together. This is a story that is written in the trees, in the mythologies of old, in our language, in the numbers, in the archaeological sites, stone circles, earthen mounds and pyramids scattered across the landscape of Earth. It is written in the Holy Books, the nursery rhymes and lies in the center of your mind. As any true alchemist knows, taking on the wisdom of old is how one comes to know the true potential and possibilities within the heart and soul of man. Our ancestors left us proof of their knowledge of the existence of a greater force, a higher mind, a conscious, creative intelligence behind the eternal ebbs and flows of the waters of time. And this being was so close to you, you could even get to know him. You are indeed an aspect of the LORD / GOD almighty, for this truth is written upon your hands. So what are you? A LORD of your own manner? A being of the SUN? A PAGAN? A JEW? How ‘bout you just be YOU, because apparently, out of all the infinite possibilities that could have arisen, YOU emerged, for YOU are exactly what GOD wanted you to be. You are made in the image of God. You are the anthropocosm. You are the universe experiencing itself. We can verify this claim by adding together the mathematics that we find on our two hands. 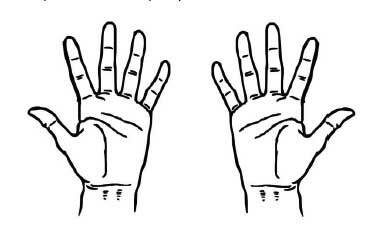 10 fingers plus 28 phalanges sums to 38. You are the universe. Welcome home. Thank you so much for your time. Stay tuned for another article in the coming months.